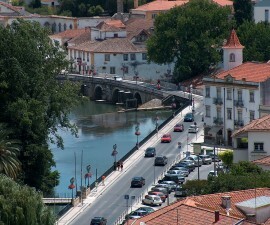 Chico Elias Restaurant is a charming Portuguese eatery near Tomar serving excellent regional cuisine. The restaurant has been a focal point for dining in the city for more than 70 years but underwent a real transformation some two decades ago at the hands of its current chef, Maria do Céu. Maria’s focus is on the traditional, slow-cooked, hearty cuisine typical of this area of Portugal, differentiated by her own techniques and unique twists on traditional recipes. The resultant effect has elevated Chico Elias Restaurant to its position as one of the best in the city and it is well known throughout Portugal for its gastronomic achievements. The restaurant has acquired something of a cult status and has been visited by many a celebrity, politician, sports star and even two former presidents, and the walls are lined with a collection of photos and press clippings paying homage to its high profile clientele. But despite its popularity the restaurant has retained its warm ambience and is as popular with local Tomar families and overseas tourists as it is with the glitterati. The service is welcoming and the décor comfortably rustic with plenty of wood and exposed brick walls. As the story goes, the restaurant’s evolution came about when Maria decided to try adding snails to the daily feijoada, the traditional Portuguese bean stew dish which serves as a staple in the daily diet of many residents. The result was an explosion of flavour and a richness to the feijoada that went down a storm with the diners and from there on Maria dedicated her cooking to seeking the richest and most unusual flavour combinations to elevate her traditional dishes to another level. The house specialities include rabbit stuffed with pumpkin, eel fricassee and roasted cod with pork but the menu is full of mouth-watering surprises. Chico Elias Restaurant’s ability to make even the simplest of dishes with precision and flair makes for an excellent meal. The restaurant is located in a nearby village, around 8km from central Tomar and is open every day except Tuesday for lunch and dinner. 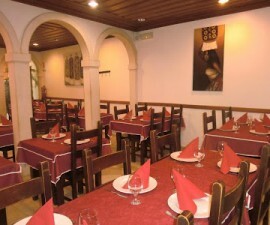 Average price per main course is 16€ – 32€, average meal price per head 30€ – €35. Note that credit cards are not accepted. Many of the most popular dishes at Chico Elias Restaurant are slow-cooked in the wood-fired oven and take several hours to complete so advance booking is necessary, both of your table and your dish.